I like to think that I am a good driver, as no doubt do you. After all, the reason I am writing this and the reason you are reading it is because of a shared passion for the world of motoring. As a result I do take driving seriously, partly because the result of taking it lightly could result in serious injury or worse, but also because I enjoy getting it right. Sod’s law will now dictate that tomorrow morning I am smeared along the outside barrier of the A14, but overall I am confident to say that I can do it safely and properly. But what about driving quickly? Well the law dictates that I’ve only driven at a maximum of 70, but I’ve dabbled in karting for many years and I’ve beaten a decent majority of those I’ve raced against. Now I must confess that I get the red mist when karting, daring myself to take a corner totally flat or committing to an overtaking move that is frankly daft and I do this without fear of injury because, let’s face it, you’d be mighty unlucky to have a karting prang and not walk away from it. And I must also confess to finishing a race feeling pretty damn good about my driving skills and manly for having tamed this 30mph beast. But this hubris was shot to pieces a few years ago when I completed that holiest of all petrolhead rites of passage: the track day. The track: Silverstone. The car: a Lotus S2 Exige. This was to be my first experience of actually driving a car at full-throttle as, rather spiffingly, we were informed in the safety briefing that we could in fact press the loud pedal as hard as we liked, on the understanding that we were prepared to drop the anchors equal vigour. Which seemed reasonable. Now I’ll be honest, I was nervous at the thought of racing around a track, but quietly confident in my abilities. It started with a 4 lap session with around 10 other Exiges, a handful of Ferrari 360s and a maniacal orange Caterham which was by far the fastest and most terrifying way around the circuit. My confidence lasted the full length of getting into the car, tooling out of the pit lane behind said orange Caterham, and being lackadaisically told by the instructor to “keep up with the car in front”. Nice idea, but it was never going to happen. Partly because my dosage of brave pills had caused short-term memory loss and I didn’t really know which way the circuit went, but mainly because my senses went into overload. It really was a barrage of bumps, screaming noise and me desperately trying to spot my braking and turning points as the scenery flew by. I’ll admit, initially it all felt a bit much. That said, I soon got into a rhythm and even overtook one of the 360s as I got ever quicker, and very soon I was going as fast as I could. I was sweating and everything! The experience was all too short and my total of 9 laps gone in what seemed like a handful of minutes. Anyway, I did get a score of 87% from my instructor, leaving me one again feeling somewhat smug! At the end of the session, I received two passenger laps at the hands of my instructor and it was about 12 seconds into this experience that my smugness gave way to pure awe. My self-delusion of driving prowess decimated and destroyed in a flurry of g-force and over-steer. However talented I thought I was at car control; however knowledgeable I thought myself to be about just what a car is capable of all came crashing down. I was genuinely shocked at the difference between a mere driving enthusiast and a racing driver. 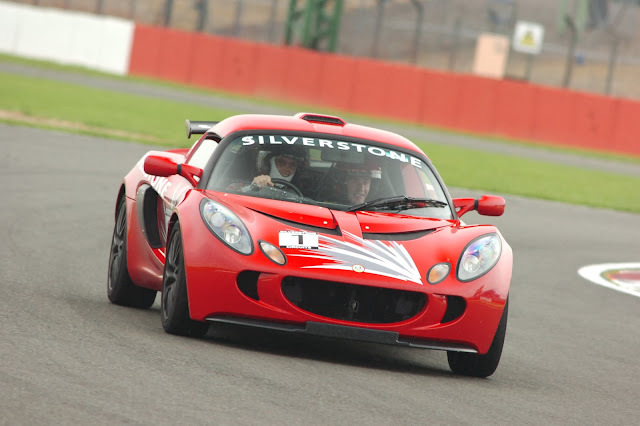 I had no idea that you can overtake a Ferrari 360 in an Exige at Stowe corner on full-opposite lock. Turns out you can. I thought I was hitting the kerbs beautifully. I wasn’t. The ferocity with which the professional hit the kerbs caused the stiffly sprung Exige momentarily onto two wheels. I thought I was the last of the late brakers. Not until you brake so hard you can feel your neck giving way can you claim that one. I thought I had my braking point into a tricky chicane sussed. Turns out I shouldn’t have been braking at all and my instructor probably had me down as some kind of massive wimp. And here lies the crux of where this is going: I was holding on for dear life with the car calling the shots, whereas with my instructor, the car sang to his tune. Every movement was deliberate. Every input was made with full knowledge of what the outcome would be. It was eye-opening stuff. I could go on all day about this, but if you have a love of driving then I urge you to have a go at a proper track day with professional instructors. Yes it is expensive and no you don’t get many laps, but to have a front row seat and see how it’s meant to be done is an invaluable experience. You will learn a precious lesson about the respect a car deserves and its ability to bite you hard. Driving at speed really does focus the mind and you become aware of every movement the car makes, every sound it makes, every bump in the road. It makes you realise that at these high speeds, if you don’t know what you are doing, you can very easily wind up travelling straight to the scene of a rather unpleasant accident. Fine if you are okay with harming yourself. Not fine to put others in danger. It made plain as day to me the difference between driving within the speed limits and and driving at speed and the difference between what you think you can do and what you can actually do. So please, go on a professionally lead track day. Enjoy it. Learn what a car can do and what you can do. And please also learn just what liberties can and can’t be taken on the public roads. I honestly believe that it will make you a safer driver.